Huawei has carved itself as one of the biggest names in smartwatch market, thanks to those feature-packed Huawei watches. The company recently launched the 2018 edition of the Huawei Watch 2, and is now working on a third iteration of its smartwatch. 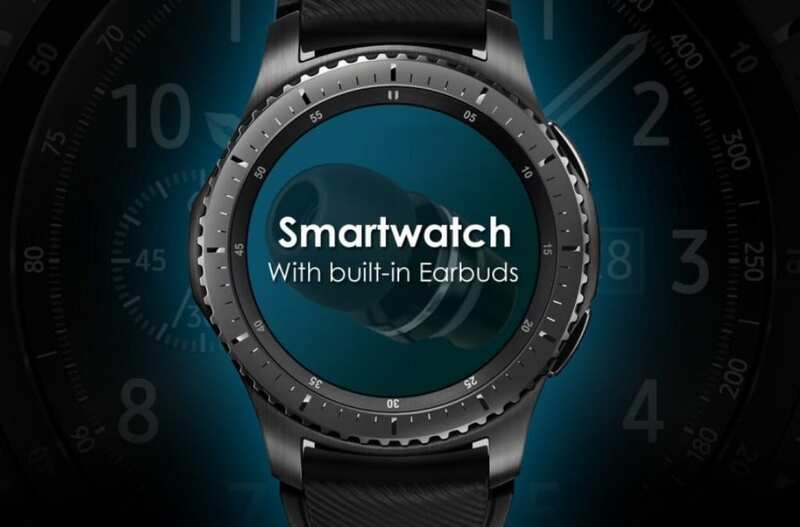 Though there’s no official info available about the watch, apart from the confirmation that it exists, we’ve seen Huawei playing with some niche ideas in the recent months, like this, and this. Huawei has now come up with another next-gen tech innovation that could pave the way for how smartwatches can be made to work independently. The Chinese company has recently been granted a patent by WIPO (World Intellectual Property Organization), that shows a couple of watch designs with built-in Bluetooth earbuds. 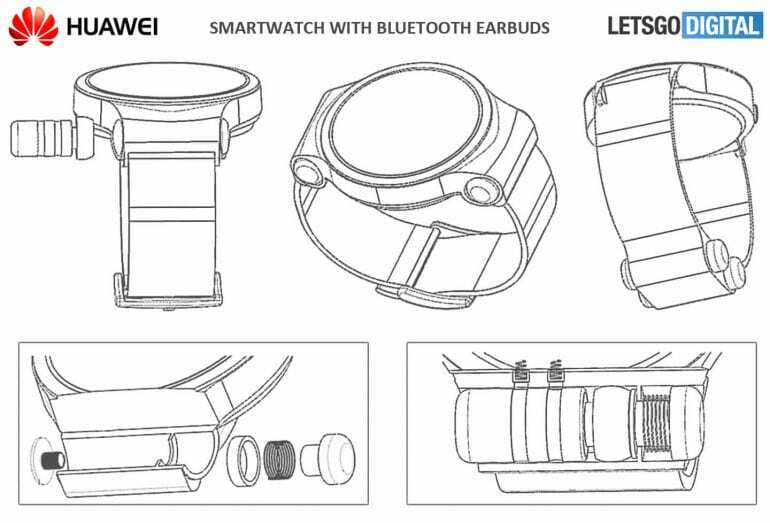 LetsGoDigital spotted a new patent approved to Huawei by WIPO, which details two smartwatch designs, both featuring built-in Bluetooth earbuds. 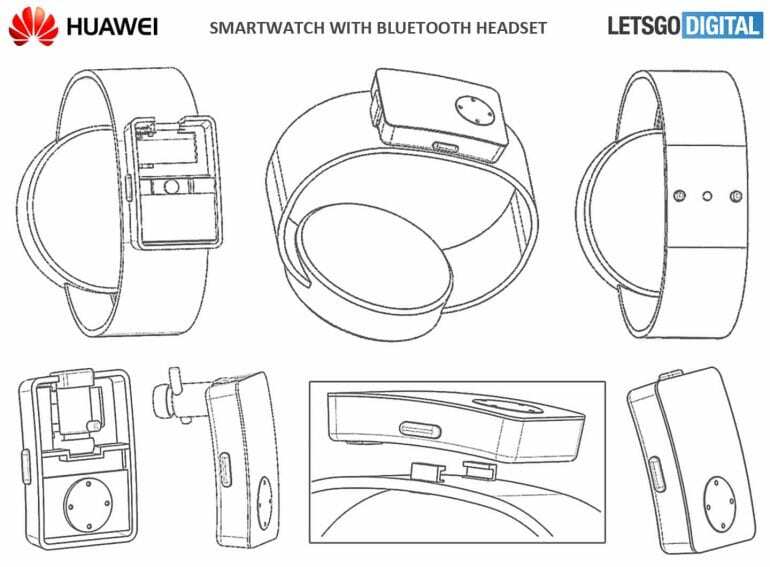 The first design shows the earbuds built into little capsule-like containers on both sides of the watch case. Users can remove the cap and take out the earplugs using a release spring. The other design shows the earbuds stored in special container on the bottom of the watch strap. The detachable container can be left behind in case the strap looks bulky, or there’s no need for earphones. This design, however, looks less ideal than the previous one, which keeps the earbuds securely within the watch case. The love for smartwatches has seen a rise lately, and it’s only fitting that their usability also sees some improvement. One of the biggest pain point of smartwatches is making and answering calls independently. One can’t literally make phone calls without taking their smartphones out from the pocket, unless they decide to awkwardly hold the wrist near the ears and mouth. This new innovation by Huawei aims to eliminate the need to carry a smartphone solely for calling purposes. But on the flipside, it inevitably adds to the size of the watch. Watchmakers are trying to reduce the already large size of smartwatches, and they’d prefer put a bigger battery if there’s any extra space left. So it’s really a questionable idea, but then again, it’s just a patent and it’s product implementation, if ever, might be on a whole different way. Meanwhile, we’d like to hear how do you like this idea from Huawei. Tell us in the comments below. The Huawei patent can be seen here.